In 1880, Edvard Grieg published a set of lieder based on poems by Aasmund Olafsson Vinje, a romantic poet in which he found inspiration. This set was named as Twelve Melodies after Poems by Vinje, Op. 33, and it's two books were carefully translated into many languajes. 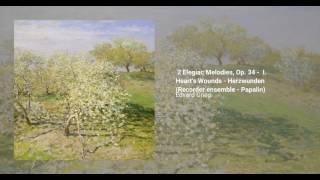 The Two Elegiac Melodies, Op. 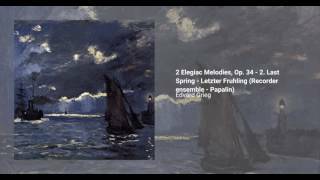 34, are string orchestra transcriptions of two of these lieder, in which Grieg rewrote the vocal lines.